Leyster is the only woman painter from Holland's Golden Age whose artistic production indicates an active role in the open art market. A native of Haarlem, she painted almost all of her known works there before her marriage to another local painter, Jan Miense Molenaer. The subjects of Leyster's paintings are taken from everyday life to make the kind of pictures that were in demand as private individuals began to replace the Church and the state as artists' chief clients. Backgammon, or tric-trac, as the game was commonly called, was a popular pastime in Leyster's day. Here the artist engages the viewer through the dramatic pose of the figure on the left. The female player, who may well be a courtesan, holds a glass of wine and offers her partner a clay smoking pipe. 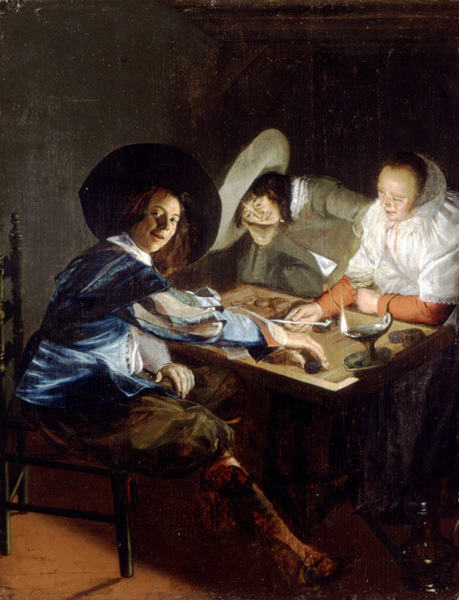 Drinking and smoking, like tric-trac, were considered idle pursuits in seventeenth-century Holland. The artificial light, which helps to focus our attention on these "vices," also emphasizes the element of seduction.